BIRTHS: Tindle/The Media: Sir Ray Tindle and the UK regional press are relieved delighted to announce the safe arrival of a newspaper, the Pembroke and Pembroke Dock Observer; a sister title for Tenby, and Narberth&Whitland. Born July 1, zero pounds and 50 pence. There’s a new kid on the Tindle block (there’s two actually – he’s opened another the Chingford Times, in London) and Sir Ray’s being praised by industry commentators for his entrepreneurial ways. I’m a Tindle old girl, from the Tenby Observer and I covered Pembroke Dock for the county broadsheet weekly, the Western Telegraph. At that time, other media with a decent foothold in the south of the county included a robust BBC Wales, the South Wales Guardian, the Tenby and Narberth&Whitland Observer series and, to a smaller extent, the Stoddart family’s startup the Milford Mercury. The Guardian is long gone -bought and closed by Newsquest (it also bought the Merc but that still exists) and I’m told BBC coverage of Pembrokeshire has dwindled but there are more hyperlocal set ups including Radio Pembrokeshire, recently a force for good in the hunt for Small Niece’s missing kitten. 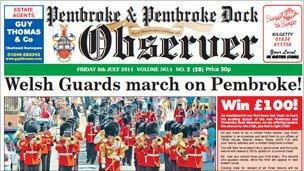 I hope the Pembroke Dock Observer succeeds (even though I guess it’s essentially a competitor of mine now). Hyperlocal content is a Tindle forte, as is UGC – grassroots events like whist drives and church notices can take up a spread in the Tenby Observer. I still don’t think hyperlocal is the financial answer for regional newspapers but the Observer brand is so strong in Pembrokeshire that I’m sure this will be a profitable little addition to Sir Ray’s stable. Have you taken the #ukjournopay study yet?